The moon and her hands both glow in the dark. Her hands have spirals on them that glow. "I wouldn't be the person I am today if I hadn't gone through that. It was part of my growing experience. When you face your mortality it gives you a different outlook on life. I learned things about myself that I know I wouldn't have faced if it hadn't been for dealing with breast cancer. Would I have rather done a retreat or a workshop?... absolutely! But that wasn't an option. So I gathered the wisdom I was given." It started long ago, The Calling. During a walk in the woods, something stirred inside her. She wasn't even sure if she felt it at first. It was so very slight, yet familiar. Not unlike a memory of something long forgotten peeking from behind a tree or over a stone. She only caught a glimpse, but it was enough. As the day turned into months, The Calling grew stronger. It was something of nature. It was something of memory. It was something of spirit. It was something that could not be ignored. In the evening as the moon began to rise, she heard the calling the strongest; A clear voice calling to her soul. “Come, find your way. You are a teacher, a healer, a teller of stories.” But she didn't see these things in herself, so she pushed The Calling aside. Who was she to do these things? To teach, to heal; these were things that were done by wise old souls. This wasn't something that she had lived long enough to even consider. She was no one special. She had no gift. She had no right. And still The Call came. Every day, every night, it whispered to her. Find your space, open up, and let it flow through you. You are part of this all. You are a light. Still, she fought with The Calling. Until one day, a friend who had lost her grandmother called. This friend poured out her soul and all the Woman could think about was a doll. Dolls had always been her companions and perhaps this would be something that would help her friend. And without a second thought, she began to make a doll from clay. She worked without thinking. She worked without a thought of time. She worked as if she were simply a tool being used by unseen hands. And when she was finished, the woman was amazed at what she saw. It was a doll that actually looked like her friend’s grandmother. Not an exact likeness, but a reasonable one, none the less. The woman took the doll to her friend and offered it to her. When the friend looked at the doll of her grandmother, tears filled her eyes. “It is exactly what I needed!” She cried and hugged the Woman who had made the doll. At that moment, the Woman knew what The Calling had meant. She didn't need the wisdom, she only needed to be open with her heart and the rest would come. And on that day, the Woman went in search of others who did the same; others who opened themselves to be tools for something bigger. She knew she needed to do this to feel complete. She knew what The Calling was. The Woman went to her computer and looked for doll makers. She found so many she was overwhelmed. She saw dolls of all shapes and sizes. Dolls from the past, dolls from the future, fairies and all sorts of magical things caught her eye. This must be it, she thought to herself. I am supposed to make the magic that people are missing. And so she began. She made forest beings and magical things. She made witches and bats and dragons with wings. But it wasn't the same as that first doll. Then she stumbles upon a class like none she had ever seen – Medicine Dolls, by Barb Kobe. And she knew in an instant that this was where she belonged. These were the dolls calling to her. These were the dolls that whispered to her soul in the wee darkness of the night. These were Her Dolls. So she signed up for the class and made her very first Medicine Doll – She Who Gathers Tears. The doll so touched her soul that the Woman was overwhelmed and basically ran scared. Again the questions came. Who was she to do this? Where did she get the right to make people feel so much with a doll? How would she ever be able to do that again? Where did all that come from? Why her? So she just disappeared from the group, citing the fact that life had gotten in the way and she had fallen behind. But she never forgot the feeling of making that doll. The Woman took her dolls to a craft sale and put them on display for the very first time. 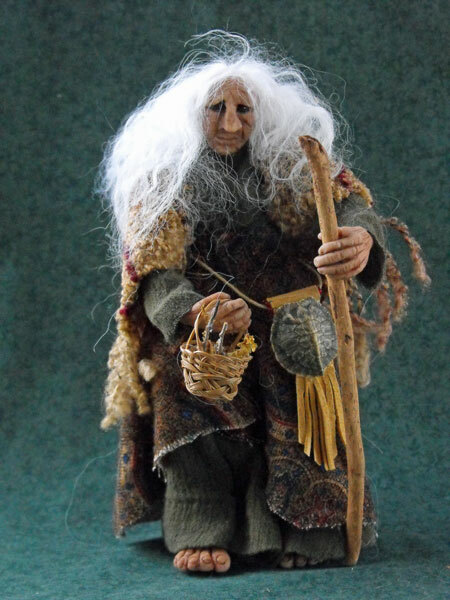 There were fairies, tree sprites, elves, pumpkins and just to make the offering a bit larger, the Woman added in some dolls that she had been “playing with.” There were spirit or focus dolls. Fiber wrapped dolls formed on branches and seed pods. They all had simple faces and were really not that fancy, but were nice to look at. The woman had so enjoyed making them that she had about 10 made. She also brought a piece that she had made from a branch that she called Goddess Rising. It was a naked woman emerging from a tree branch. She had no hair and was not really what you would call beautiful, but the Woman brought her anyway. To the woman’s surprise, the Goddess Rising had sold before the first 10 minutes of the show to a woman who again, insisted that the sculpture/doll was made just for her. The spirit dolls all sold with the same reactions from the people who looked at them. The same words came out of each person, “This was made with me in mind!” That left the Woman sitting at the show making custom dolls for people all day. And it wasn't the selling of the dolls that was important to her now; it was the look on the faces of the people that found her dolls, the ones made just for them. It was the joy she saw in their eyes and their smiles. It was the tears that came when some held the dolls. That was the magic, the healing that she had been striving for all along. When the Woman came home that day, she looked up Barb Kobe’s Medicine Doll Workshop again. She knew that this was what she was supposed to be doing, but she had walked away before, so how could she go back? For months she pondered how to make this happen. She thought and thought and finally decided that it was something she just had to do. So she contacted Barb, and to her delight, Barb welcomed her back with open arms. The Woman was delighted! She was ready to jump in and give it her all this time. .. Then something happened. The woman found a lump on her breast. She didn't tell anyone except her husband. She went to the hospital and they said – yes, it’s cancer. But the woman didn't break down. For some reason, she knew this was part of her growing. This was part of how she would understand healing. This was part of her passage into a wisdom she didn't have. And now that she has recognized this, she is ready to work her own healing medicine. She is ready to make her dolls. She is ready to heed The Calling.